Short Fat Dictator: When Did I Get Like This? 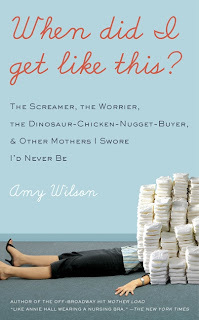 It's a first at Short Fat Dictator - this week we are featuring a guest post from author Amy Wilson. Amy is an actress, a writer, a former comedy partner of my sister's, and a mother of three. But what you really need to know about Amy this week is that she is the author of the very funny and thoughtful book When Did I Get Like This? : The Screamer, the Worrier, the Dinosaur-Chicken-Nugget-Buyer, and Other Mothers I Swore I'd Never Be. And guess what? It is available TODAY in paperback. 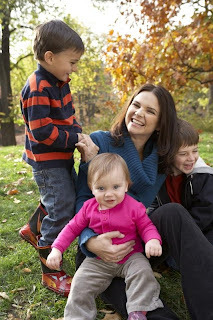 People often told me, when I was pregnant, that I was “all baby,” meaning that I carried predominantly in front of me rather than an all-over increase. This is a very nice thing to say to a pregnant woman, whether or not it is actually the case, and I took great comfort in it the first time around. But by my third pregnancy, my stomach got so big so fast it looked like the baby was lying perpendicular to me, head at my spine, feet pushing my belly button improbably outward like the center pole of a circus tent. Please don’t say anything. PLEASE. Please allow my girth to go unacknowledged. STRANGER: What do you, have TWINS in there? UNCLE DAN: Did she get this big with all of them? Wasn’t that so nice of him? It was so nice I wanted to kick him with my cankles. The only thing worse than being as big as I was that summer was having all those nice people remind me. I stopped dead in my flip flops, turned, marched back to him, and stood my ground. I stomped away to the hoots of his coworkers, throwing them all the parting gift of my middle finger. I was doing a public service. Maybe they’d leave the next pregnant woman alone. Now, when I see a pregnant woman, the bigger she is, the more assiduous I am in leaving her the hell alone. I give her thirty seconds off from talking about her preposterous size. The mommy jumpy castle is not there for my amusement. Yes, Amy has nice hair AND managed to secure a picture of herself with all three of her children looking adorable. But we must not hold that against her. Because we're better than that. Or, at least we should pretend to be when we're out in public. If this taste has not satisfied your appetite for all things Amy Wilson, check her out at any of the spots below. Tell her the Dictator sent you! Please note, it is now is the time to stop reading and go buy Amy's book.